In the following story the reader will find, besides the personal opinions of the writer, direct quotations from the works of the esteemed authors listed as the sources. One of the most interesting, industrious and powerful personages to grace the pages of history during the eighteenth century is Catherine II, Empress of all the Russias. Historians have not always been kind to her memory, and all too often one reads accounts of her private life, ignoring her many achievements. The stories of her love affairs have been vulgarized and can be traced to a handful of French writers in the years immediately after Catherine's death, when Republican France was fighting for its life against a coalition that included Russia. 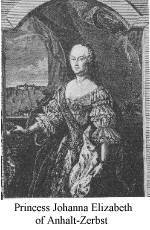 Catherine was born Sophia Augusta Frederika of Anhalt-Zerbst on April 21, 1729 in Stettin, then Germany, now Poland. Her father, Prince Christian Augustus of Anhalt-Zerbst, a minor princeling among the fragmented principalities in Germany, had married the much younger Princess Johanna of Holstein-Gottorp. The house of Holstein could lay claim to the crown of Sweden. Instead of making a more brilliant marriage, her family had arranged a match to this Prince of modest position. After Sophie was born, her mother soon became bored with the provincial life of Stettin, where her husband was a high ranking officer in the Prussian Army. As Johanna was related to many noble families in Germany, she took every opportunity to travel to the courts of Zerbst, Hamburg, Brunswick, Kiel and even Berlin. 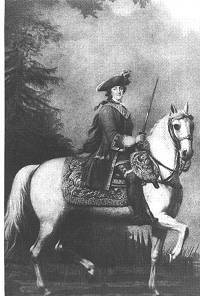 Years before, Johanna's brother Karl August of Holstein-Gottorp had gone to Russia to marry the Princess Elizabeth Petrovna, daughter of Peter the Great. Before the wedding took place, the Prince died of small pox, leaving Elizabeth heart-broken. Her sister Anna had married the Duke Karl Frederick of Holstein-Gottorp. Three months after giving birth to a son, Peter Ulrich, Anna died of tuberculosis. When Peter Ulrich was ten years old, his father died, and the claims to the throne of Sweden passed to his son. 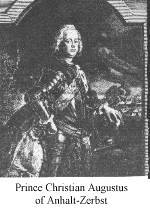 As the only surviving male descendent of Peter the Great, he was also potentially heir to the throne of Russia. In November 1741, Elizabeth seized the throne with the help of the Imperal Guards, overthrowing the Empress Anna Leopoldovna, who was regent for the infant Ivan VI. This line of succession stemmed from Peter the Great's older half-brother and co-ruler from 1682-1696. The Empress Elizabeth formally declared her nephew Peter Ulrich of Holstein-Gottorp heir to the throne, brought him to St. Petersburg and changed his name to Grand Duke Peter Fedorovich, the future Tsar Peter III. Peter was now 14 years old and it was time to look for a bride for him. Elizabeth had always remembered the family of her dead fiancee with fondness, and having heard Princess Sophia's name from the Prussian ambassador, she made a decision. The elder branch of the Anhalt's had died out, and Prince Christian August and his brother became reigning princes of Anhalt-Zerbst. It was here in Zerbst, on the first day of January 1744, when a courier arrived with an invitation for the Princess Johanna to come to St. Petersburg, "accompanied by the Princess, your elder daughter." Sophie's father was not asked to come. He was known for his strong Lutheran beliefs, and it would be necessary for Sophie to change to the Orthodox religion, if she were to marry the heir to the throne.